HT Mobile Apps caught up with Luke Roussin, Marketing Director of First State Community Bank ($1.7 billion assets, 45 branches) for a chat about Banker Jr.
How did you first learn about Banker Jr.? We met Kathleen Craig at the ABA Marketing Conference in the fall of 2013. We hit it off great and were delighted to learn about Banker Jr.
You jumped right in to become one of the first banks to launch Banker Jr. What sold you on it so quickly? FSCB’s kids club, Junior Savers, has been around for more than 20 years. Though out the years we’ve been hosting small events in our branches to engage with the club members. Events and activities like Mother’s and Father’s Day card making sessions used to draw lots of kids. But in recent years, fewer and fewer children have been attending these events. The reality is that kids are busier than ever before. With soccer practice, piano lessons, tutoring, and more, kids today just don’t have time to visit a branch to do a craft or activity. We knew we needed another way to connect with our Junior Savers. And today, that means digital. When we learned about Banker Jr, HT Mobile’s app for children, we knew we had found a relevant tool that would help us reconnect with our Junior Savers club members. It made sense for us to grab the opportunity to be one of the first to offer this new digital tool to our club members. It was a great chance to get moving on our bank’s mobile-first strategy. How does Banker Jr fit in with your other financial education efforts? Banker Jr is a nice complement to the materials and activities we already offer as part of our Junior Savers Club. Since we didn’t have a tool like this, Banker Jr easily fit in to our existing program. How do you spread the word about Banker Jr? We talk about Banker Jr in the quarterly newsletter that goes to our Junior Savers club members. FSCB’s Junior Savers Club sponsors events, like kids’ movies in a local park, where we can hand out stickers and information about Banker Jr. We also included Banker Jr in our Teach Children to Save Day programs in local schools this spring. So what has been the response to Banker Jr? Well, the kids love it. They are very engaged and love dressing Piggums and playing the games. The educational aspect of Banker Jr is spot on. The kids are entertained and don’t realize they are learning too. Parents love it too because it’s not junk. Banker Jr is not some game app that you later discover is all about sharks eating people. 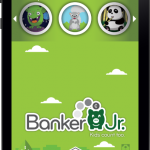 Banker Jr creates “good parenting moments” by giving children an app that is entertaining and educational. Any tips for other financial institutions considering Banker Jr? Yes, you’d better get going on mobile or risk being left behind! Banker Jr is an easy-to-run program. Our busy marketing team appreciates that HT Mobile Apps handles all the technology parts of the app. They keep it working and keep it updated. We can focus our energies on promoting it and getting families to try it out. If your bank already has a children’s club, then Banker Jr is a slam dunk. It complements any curriculum and provides a digital tool that kids will use. Banker Jr can really enhance your kids club program. What are you waiting for?